Miranda Suess is a sweet, outgoing, and quirky NYC photographer, which we know from personal experience (not just because she used those three words to describe herself). Miranda recently photographed a GigMasters workshop in NYC where she captured headshots of vendors and the event itself. The photos turned out amazing and she was such a pleasure to work from start to finish. We caught up with Miranda after the event to learn more about her and her photography business, and see what advice she has for photographers that are just starting out. Tell us a little about yourself and your photography business. When it comes to photography, my business is a lot like my personality in many ways. Sweet, outgoing, and quirky give a good overall picture of the relationship! I do admit that I’m pretty easy to get along with and taking pictures with me will not only be a comfortable experience, but also a super fun one too! My journey to photography started when I was young using my old point-and-shoot and disposable cameras and organizing photo shoots with my neighbors and the kids I babysat for fun. As a young teen, I started photographing most of my family gatherings and high school friends' events for fun. I fell for photography hard when I saw the passion and support from my parents and grandfather when I graduated from high school and my grandfather gifted me with my first DSLR camera, a special family heirloom. Not long after, I was managing an entire portrait studio at an Arizona Walmart and it’s grown from there. When it comes to how I photograph, I pride myself on being able to photograph connection extremely well. 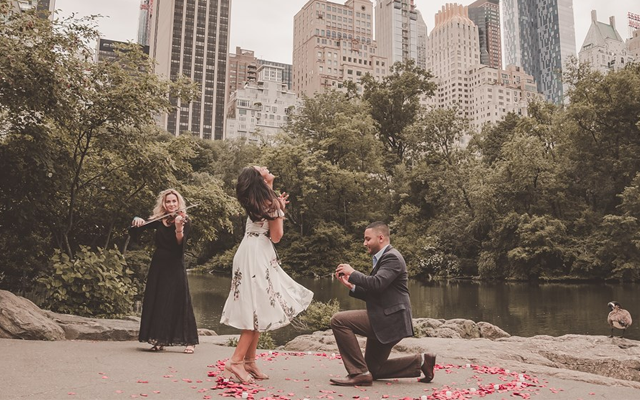 I live for fun, exciting, carefree events that involve dancing and an all-around good time - someone winning an award, celebrating a birthday, marrying the love of their life, and more are the moments that I take seriously and preserve as important and meaningful memories for my clients. With this drive at the forefront of my business, I’ve photographed in many cities and moved to New York City from Los Angeles in January of 2018 to continue my quest to grow. Since moving, I’ve served so many and learned so much and still been able to hit my personal goal of 10 weddings this year. I have an even bigger goal for 2019 of at least 20 weddings and other celebrations to photograph! This is my dream, a full-time passion to capture the best moments in life. Tell us an interesting fact about yourself that most people might not know. One of the most interesting quirks about me is that sometimes I honestly wish I were a mermaid. Other times I want to buy a pet penguin. Crazy, right?! Most times, though, I just wish there were more hours in the day to enjoy life. What do you love most about photographing special events such as weddings? My favorite part of photographing special events is the connection. Human connection is like electricity! detail helps someone experience it all over again through photos and I love capturing it all. Do you have a favorite event you've photographed over the years? One of my favorite events was at a really special wedding. Weddings will always be one of my favorite events of all time to photograph. 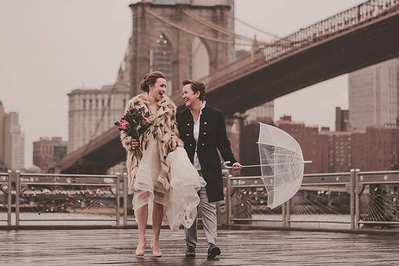 For this particular wedding, it was raining which could really ruin someone’s day but both brides (#LGBQT) were totally chill about it! Neither of them was bothered by it and it made the whole atmosphere better for everyone. They rented a classic checker cab to take us around Brooklyn in search of the best scenic spots. The rain ended up being a blessing because there were little to no tourists at some of the most iconic Brooklyn spots! The photos were, and still are, some of my favorites! See the full gallery here. What advice would you give to new photographers that are just getting started? During my photography career so far, some of the most important things I’ve learned is that you have to keep challenging yourself. My advice to new photographers would be to remember that it’s a constant learning process. It’s a continual journey to practice your craft, improve your artistic abilities, and work hard to stand out from others. Take on new challenges without fear, experiment when you can and take each session as a new lesson. If you have the opportunity, shadow a local photographer who you admire and soak it all in - the praise and the criticism. There’s no end to this form of art so take your time and understand that it could take weeks, months, or even years to develop your personal style but it’s something you should always be striving for. With more actionable advice, always back up your photos numerous times for storage. Shoot in RAW. Use Lightroom editing techniques and learn anywhere you can - even YouTube can be a huge resource. And most important of all, don’t be afraid to charge what you’re worth :).